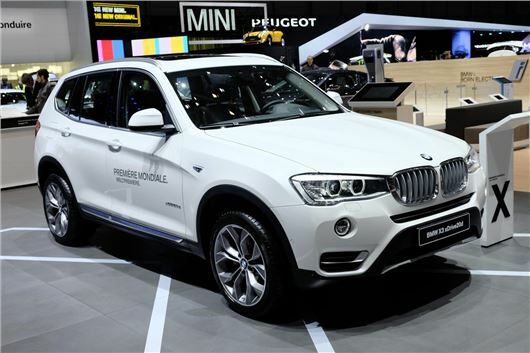 The BMW X3 mid-life facelift model has made its first appearance at the Geneva Motor Show. The new car receives cosmetic tweaks, improved standard equipment but the big news is its new range of more economical and efficient engines. Inside, the changes are less obvious, although BMW has improved seating materials and introduced new cup holders, with a sliding console cover. Standard equipment has been bolstered across the range, with entry level trims getting sat nav, heated front seats and an automatic tailgate as standard. Boot space remains unchanged at 550 litres and this can be increased to 1600 litres with the seats down. The diesel engine line-up has been revised to meet Euro 6 emission standards and there’s an new all-aluminium 2.0-litre diesel. The new powerplant is most efficient in the rear-wheel drive sDrive18d, which uses a six-speed manual gearbox and low rolling resistance tyres to return a claimed 60.1mpg. CO2 emissions are 124g/km. There are three further models - xDrive20d, xDrive30d, xDrive35d – and all get four-wheel drive as standard. The mid-range xDrive20d also gets the new 2.0 diesel engine, but with 190PS and 400Nm of torque, while CO2 emissions are 138g/km and fuel consumption is 52mpg. There are three trim levels on offer - SE, xLine and M Sport – and SE models get full leather, two-zone air conditioning, cruise control, 17-inch alloy wheels and automatic headlights. XLine models can be identified from the outside by metallic inserts in the bumpers, aluminium side cladding and bars in the air intakes. M Sport variants get upgraded aerodynamic styling, 19-inch light alloy wheels and sport seats. The updated BMW X3 goes on sale in June and prices start at £30,990.